This is the month every hustler anywhere around the world bring into calculation all they have laboured for and decide how to return home. And this is why ACEworld will be giving writers and poets from around the world the opportunity to publish their works with swift response and immediate publication. 1. 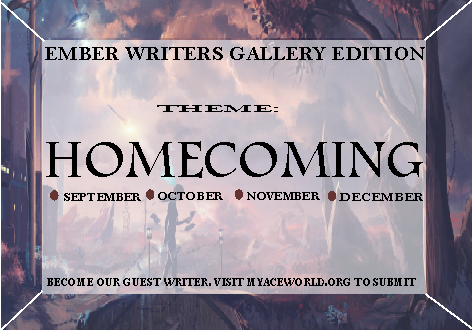 Submit only works themed on homecoming, reflection, accountability, meditation, mindfulness, and any other sub-theme related to the aforementioned. 3. Make sure every poem/story/essay have their own well written title and are well formatted. And if you're sending a photograph/artwork, make sure they retain their high resolution in the course of submission to aid appearance. 4. Submissions are acceptable only as attachment (doc or docx format. We do not accept pdf.) No specification on font style and size. Please send a befitting picture of yours to accompany publication. 5. Include a short biography of not more than 70 words. And please, your picture is important. Without it, your submission will be trashed without being read. 7. If you're pasting in the body of the mail, make sure it's well spaced and every information included. 8. Sending a photograph/artwork? Just attach the pictures and write a short biography in the body of the mail with any other short note you will like to include (if any). 9. All copyrights remain yours. 10. We do not accept previously published works. Don't just leave like that. Read some of the featured literary works on our Magazine. Visit our homepage and get yourself everything you need to be updated.